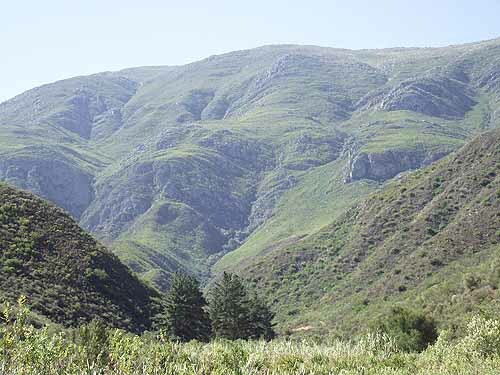 Just outside Robertson in the Western Cape about 1.5 hours from Cape Town is a small nature reserve called the Pat Busch Private Nature Reserve. 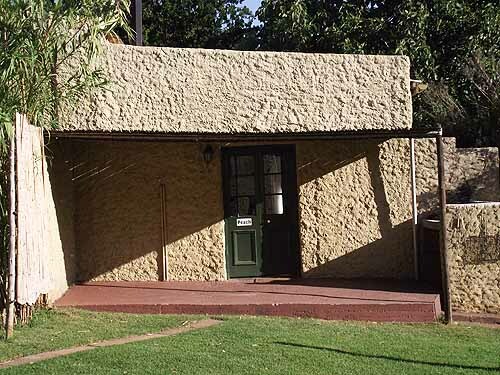 It is situated about 15 kilometres east of Robertson on the Klaasvoogds West Road. Once you turn off the R62 you drive along a winding country gravel road until you reach the Berg en Dal farm on which the reserve is situated. 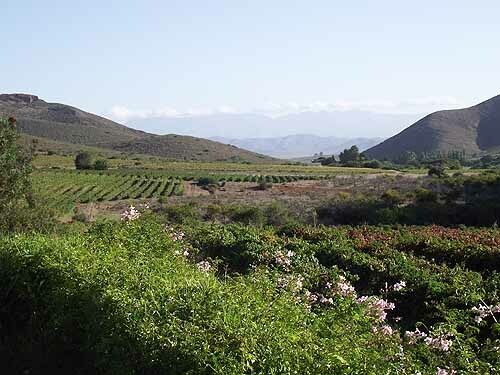 The reserve includes part of the Klaasvoogds West foothills in the Langeberg mountains which surround the farm. 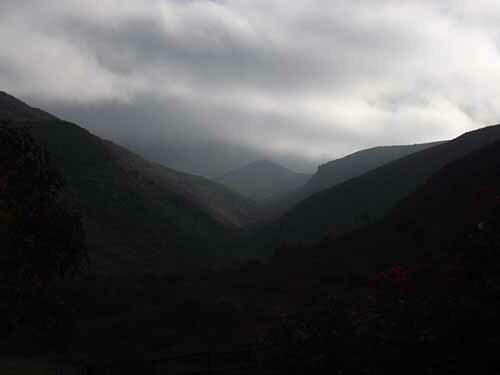 The 2000 hectare reserve is covered with mountain fynbos which includes proteas, reeds and ericas. 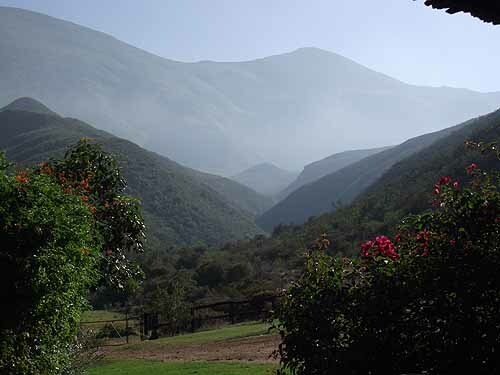 There are a number of small rivers and streams running down the mountainside and through the farm property which all add to the beauty of the place. 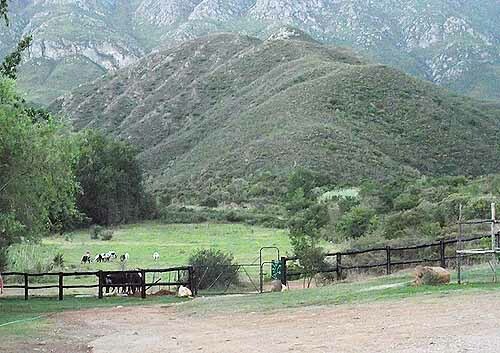 For people who are nature lovers the reserve offers a number of outdoor activities which include several walking trails, a 4X4 trail, farm dams which can be used for swimming and fishing and a large variety of bird life, some of which can be spotted from your chalet's stoep. 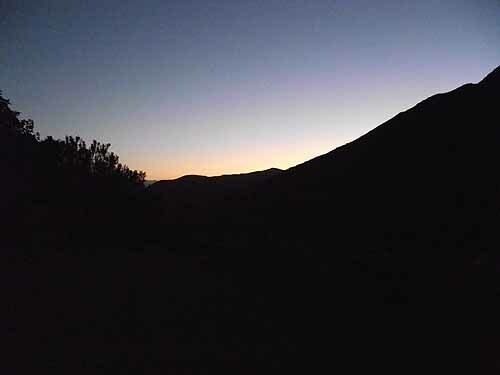 The walks and trails have various degrees of difficulty and most of them return along the same trail as the one used on the outward hike although you can combine two trails into one hike in certain instances. Because of this a two hour outward hike will also mean a two hour return hike. A short 10 minute hike from the comfortable chalets that are for hire will get you to the closest farm dam. The hike is along a gravel road with a short climb up to the dam at the end of the hike. The dam is surrounded by mountains and hills on three sides and a gravel dam wall on the fourth side. It is stocked with large and small mouth bass which one can fish for as long as they are released once caught. I have never caught a bass before and never used a spinner either and it took me all of 15 minutes to catch my first bass fishing from the bank. Two boats are available for those who want to fish on the dam and if you find the right spot you can be pretty successful and catch a few bass. Other than the fish there are also fresh water crabs in the dam. Swimming in the dam is a whole new ball game as the shallow water along the edge of the dam is filled with slimy grass which tickles your legs when you enter the water. A pretty eerie feeling! The minute you set foot in the water you disturb the mud and the water turns brown around you. So much for the lovely shower you had that morning. Once you are in the cool water and floating all the eeriness goes away and you can enjoy the cool refreshing water. My wife and I had some fun hiking along the road to the dam. 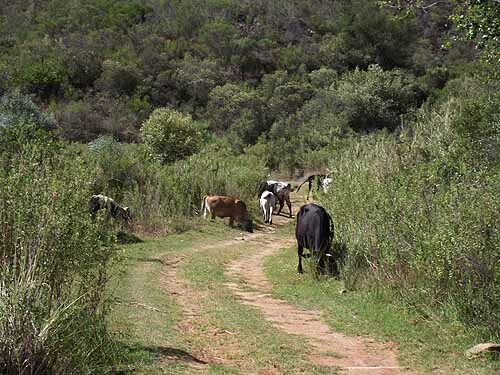 We were not aware of the herd of Nguni cows that live on the farm and as we rounded a short bend in the road we walked slap bang into this herd of about fifteen animals which included cows, calves and two bulls. 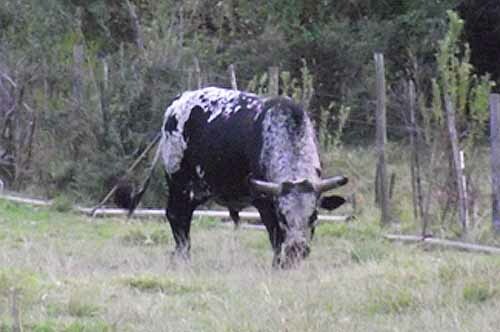 We were not worried about the cows but when we spotted the bulls we made a quick getaway until the herd had moved off. On the way back to our chalet along the same gravel road we spotted the herd grazing in the field alongside the road behind a fence. We thought that the bulls were with them but as we walked past some bushes we discovered the bulls about three metres away in the bush. I warned my wife, who was walking about 20 metres behind me, of the bulls and all I saw was a lightning bolt as she sprinted past me. I've never seen her move so fast before.We chatted to the owner after the incident and he told us that the cows were pretty harmless and had not bothered anyone visiting the reserve. I still have a healthy respect for a ton of beef on the hoof. 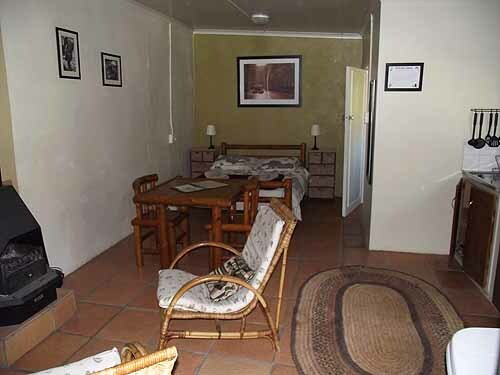 The chalets on the reserve are very comfortable and have everything one needs to self cater. Most of the small chalets sleep three or four people while the bigger farmhouses sleep more. A total of 46 beds are available in the various chalets and houses. 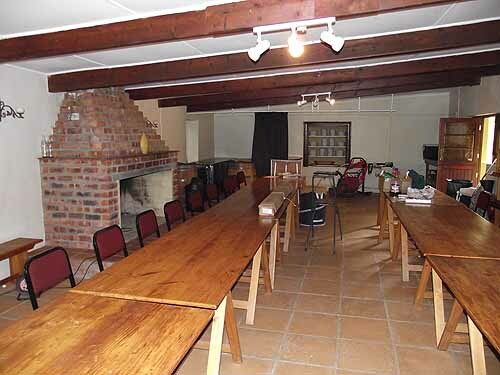 There is a largish rustic hall where conferences and weddings can be held and catered for. The various cottages all have different names such as Fig, Quince, Pine and if you look closely you will find a tree with the same name close by. What is really nice is the silence. 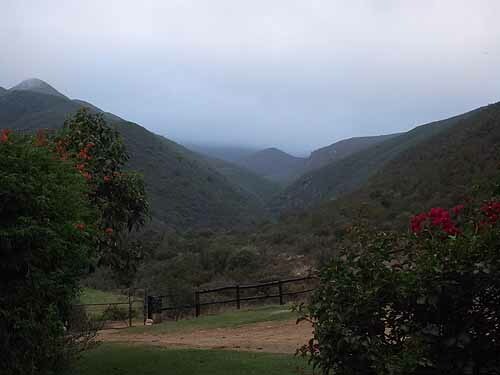 You can sit and watch the mountains change as the light changes from the stoep of your chalet and hear and see the birds flitting about looking for food. It is so quiet that the sugar birds flapping their wings becomes a loud noise. The sunsets are spectacular. There are a number of large oak trees scattered among the chalets and its an eerie sound hearing them dropping their acorns onto the roofs of the chalets especially at night. There is wildlife in the form of antelope on the reserve. We never came across any during our stay but there is evidence of their visits as they leave their droppings on the lawns around the chalets. Mosquitoes are unfortunately more frequent and noisy than any other wild visitors. They visit you in your chalet from early evening especially during the summer months and if you don't protect yourself you get eaten alive throughout the night. 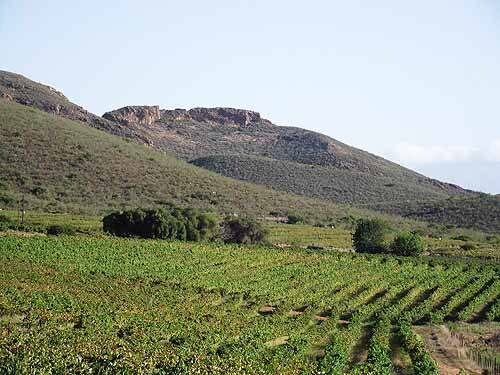 The farm Berg en Dal is still used for farming and boasts a number of vineyards which supply grapes to the local Robertson co-ops . The farm used to make its own wines under the Rustica label using old type wine making equipment and presses but has not done so for two seasons now . The antique wine making equipment is housed in the tasting room of the Rustica cellar where the wines are also made when the farm decides to make a batch. Older vintages of the Rustica wines are still available for purchase from the cellar. The Pat Busch Private Nature Reserve has another secret. It has no reception for TV or cellphones. 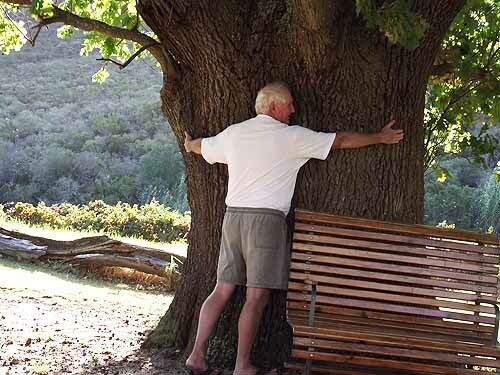 Some people visiting the reserve find this difficult to handle and suffer withdrawal symptoms but once over them enjoy the fact that no one can bother them and that they can relax and enjoy nature undisturbed. In this day and age it takes some getting used to. For people who would like to get away from the rat race for a few days and get to enjoy nature without their modern day conveniences bothering them the Pat Busch Private Nature Reserve is the place to visit. Let's see you there soon!